A great Bloody Mary can be enjoyed year-round, especially during weekend brunch, but there is more to it than just vodka and tomato juice. Here’s some fun facts about this “Meal in a Glass” which makes it perfectly acceptable to imbibe before noon, plus the best Bloody Mary cocktails and weekend brunches I have found in Orlando. It is reason to make reservations and go have a brunching good time with friends! January 1st, New Year’s Day is also National Bloody Mary Day. It seems quite appropriate after a night where over-imbibing is the norm, don’t you think? The Bloody Mary is the most popular brunch cocktail in the United States. 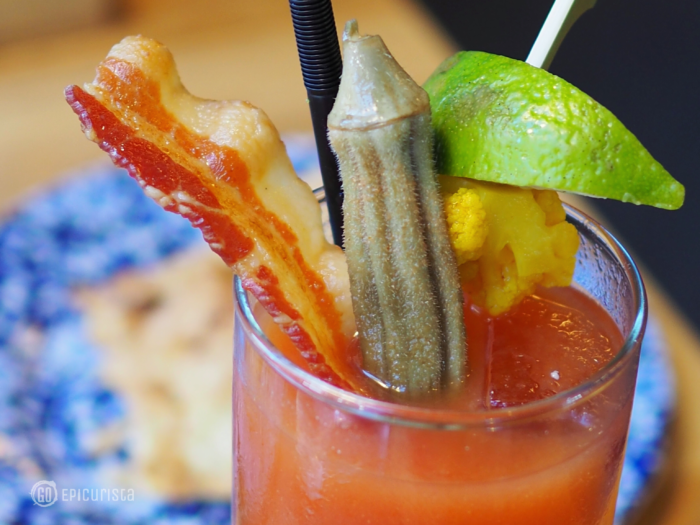 Have you ever been to a weekend brunch and not seen a Bloody Mary? It’s believed the Bloody Mary, with its combination of vegetable juice, which settles the stomach, salt to replenish electrolytes and alcohol to relieve headaches, helps alleviate hangovers. Unfortunately it is a tall tale as tall as the glass it comes in. Drinking alcohol will only further dehydrate you. Nonetheless, it’s a tasty beverage. If you want to feel good, consider this a great way to drink your veggies. Using a celery stick as a garnish came about in the 1960s at Chicago’s Ambassador East Hotel. An inventive customer used a stalk of celery from the relish tray to stir his Bloody Mary when the drink arrived without a swizzle stick. Common garnishes today include everything from bacon to cheeseburger sliders! This is why we call it a Meal in a Glass! HIghball & Harvest Hail Mary garnishes are epic! Beef Jerky, bacon and pork crackling are meaty heaven! A good Bloody Mary is more than a drink. It’s a meal! In today’s age, the drink often includes hot sauce (likely Tabasco), horseradish, celery salt, clam juice or olive brine, brown sugar and bitters. Mixologists often revel in creating unique recipes for their Bloody Mary mix. The tomato juice base mix should be hearty, a bit (or a lot) spicy, and full of flavor. The vodka must be of good quality, and even better when it’s infused or flavored. And finally, don’t forget the garnishes. A celery stalk, the traditional accoutrement just won’t do all on its own. You want lots of tasty bites, from cheese and hard salami, olives, dill pickle spears, lemon wedges, dried sausage, shrimp and pickled veggies, to candied bacon, grilled cheeses and sliders. This is where we differentiate between the ‘meh’ and the ‘wow’. Of course, if you’re a purist and prefer a classic without the crazy garnishes, we don’t judge. Also a Virgin Mary is just as great if you want to skip the alcohol. Whatever you like is what you should order. If you want jaws dropping when a Bloody Mary arrives at your table, then check out these fantastic restaurants in Orlando and the fantastic brunches they offer. They know how to make a great Bloody Mary. Brunch is served Saturdays and Sundays at this Mount Dora destination restaurant. 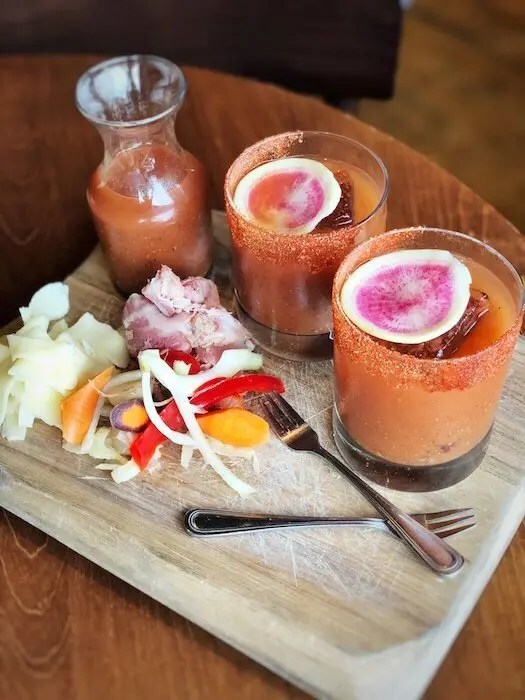 Their Bloody Mary came served in a pitcher for two with an array of garnishes to “make your own.” House cured bacon, pickled veggies and cheeses combine with a perfectly zesty Bloody Mary mix. Pair with Southern Florida favorites like Andouille Hash with a Sunny-Side Up Egg and Chicken and Waffles or go for a more eclectic Wood Oven Fired Israeli Shakshouka with Lamb Merguez, Farm Eggs, Feta & House Pita. The charming town of Mt. Dora is perfect for a walk after brunch. 142 East 4th Avenue, Mount Dora. Visit website for more information. The Florida native lovable celeb-chef Art Smith, who became well-known as Oprah’s personal chef, has made Disney Springs Homecomin’ Florida Kitchen a mouth-watering must stop. His Rise & Shine Southern Brunch on Sundays is a love letter to Florida cooking are everything you expect from the South. Decadent and bold dishes full of flavor that require stretchy pants to fully enjoy. This is not your typical mimosa / Bloody Mary brunch. Take your pick of five epic Bloody Mary’s including the Proud Mary, the Southern Mary with Tomato Vodka topped with a fried green tomato and pimento cheese stuffed olive, the Whiskey Mary with Ole Smokey Mango Habanero whiskey, the Garden Mary with cucumber infused vodka, garnished with crisp peppered cucumber and the Bloody Maria made with tequila and garnished with pimento cheese stuffed olive, and Tasso ham. Pair with Hush Puppy Fried Chicken Benedict with a decadent pimento cheese Hollandaise sauce, Short Rib Hash with sunny side up local farm eggs. Don’t miss the house made doughnuts with Pecan Bacon and caramel glaze. Visit website for more info. The House Bloody Mary at downtown Orlando’s sensational French-inspired brasserie, DoveCote, is served by the glass or 32oz jug. House made pepper and horseradish infused vodka and house Bloody Mary mix come together beautifully. A strip of bacon and house pickled veggies, like okra and cauliflower, add the perfect final touch. The secret ingredient is the house hot sauce, which gives the fresh-made tomato base a peppery spice slightly sweetened with local orange blossom honey. Pair it with the ample portion of extra crispy fried chicken (also served with the house hot sauce and a creamy Louie Remoulade sauce) and you have yourself a satisfying brunch experience in a casually elegant setting. Available only during Sunday Brunch 10:30am – 2:30pm. Located in the Bank of America Building, 390 North Orange Ave, suite 110, Orlando. Complimentary self parking is available in the attached garage. Visit website for more info and reservations. For a different kind of brunch, check out Dragonfly Robata Grill & Sushi’s Unlimited Izakaya Lunch every Sunday from 11 am to 2 pm. Get your fill of bottomless Izakaya favorites such as made-to-order, live chef’s stations manned by master sushi chefs preparing all-you-can-eat nigiri, maki, and poké, Japanese sliders, crispy bao, dumplings, takoyaki octopus fritters, Chicken Katsudon, pork ramen, pork curry rice, desserts and of course, endless adult beverages. Their Sake Bloody Mary is a nice departure from the vodka standard. Located in the Dellagio Plaza. For more information, visit website. Dragonfly Izakaya Lunch is a wonderful alternative for those who prefer Asian dishes for brunch. If you’re looking to enjoy an epic Bloody Mary while watching your favorite sporting event from a multitude of TV screens, look no further than Duffy’s Sports Grill. Their All-American Bloody Mary, made with Tito’s Handmade Vodka, tomato juice and savory spices is topped with the most American of all foods – a Bacon Cheeseburger slider! The Bloody Mary Brat mixes Jägermeister into your Bloody Mary, and tops it with a beer-infused bratwurst. This Lake Worth Florida-based chain has multiple locations throughout the state. Bloody Mary is on the menu daily. Visit website for more info. Not only is the Sunday buffet brunch menu at Highball & Harvest absolutely epic, serving everything from shellfish raw bar to carving stations, made to order omelets, pancakes and waffles, cheeses, charcuterie and a dessert display like no other. Bloody Mary fans have their pick of three Bloody Mary creations at this casual American eatery inside the luxurious Ritz-Carlton Orlando Grande Lakes. The Green Mary is a veggie delight with celery bitters, St. George Green Chile vodka, and a rosemary salt rim. It’s garnished with dill, cucumber, celery, heirloom tomatoes, and thyme for a fragrant garden in your glass. If you’re looking for something exotic and spicy, The Bloody Caliente offers a departure from vodka with smoky Fidencio Mezcal. Mixed with lemon juice and house made Habanero shrub, it has a sweet-spicy flavor that will wake up those taste buds. A cayenne pepper and salt rim, plus jalapeno slice, lemon, lime, heirloom tomato and fresh cilantro garnish the glass. 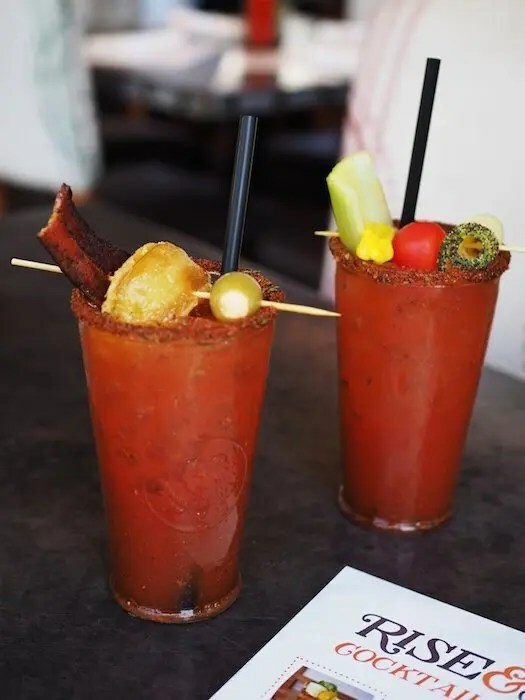 For the meaty Bloody Mary to win them all, The Hail Mary mixes Absolut vodka with Old Bay Seasoning and black sesame salt rim, garnished with dill, bacon jerky, heirloom tomato, pork crackling, and lime. This is truly the most epic of them all! The house made beef jerky alone will have you ordering more than one. Sunday Brunch is served from noon – 2pm. Complimentary valet parking available. Located at 4012 Central Florida Pkwy, Orlando. Visit website for more information and reservations. Paddlefish Bloody Mary comes with a Seafood feast as a garnish! In a picturesque lakeside setting by the Tranquilo Golf Course of Four Seasons Orlando Resort at Walt Disney World Resort, sits Plancha Restaurant. The resort casual Cuban-American inspired eatery serves an expansive Sunday Brunch, featuring buffet stations and a la carte dishes, fresh pressed juices and bottomless Bloody Mary and mimosas. You can read all about the menu here. 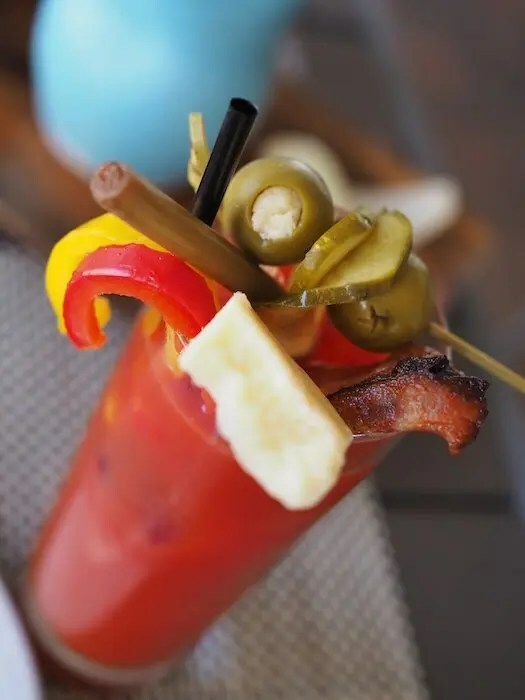 In true Four Seasons fashion, the Bloody Mary bar gives you a variety of Bloody Mary mixers and garnishes including bacon wrapped asparagus, beef or gator jerky, stuffed olives, peppers, a multitude of hot sauces and more. Garnishes change regularly. The Fried Chicken with White Cheddar Waffles and spicy maple syrup is a perfect pairing. Only available during Sunday brunch, 10am-3pm. For reservations, call 407 313 6161. Located at 10100 Dream Tree Blvd, Lake Buena Vista. Visit website for more information. At Raglan Road Irish Pub’s “Rollicking Raglan Brunch”, you’ll find “The Cure” and it’s guaranteed to do just that! Cure anything that ails ‘ya! Their house-made Bloody Mary mix has just the right spicy kick and the glass is rimmed with bacon. Enough said. This authentic Irish Pub, located in Disney Springs, is one of my favorite restaurants in Orlando. A surprising menu of elevated Irish pub food, craft cocktails featuring many unique craft Irish spirits and a rousing display of Irish entertainers, musicians and dancers to make your Sunday brunch feel like Friday night! Those with big appetites can’t miss their “Full Irish” breakfast in all it’s glory with sausage, black and white pudding, bacon, roasted tomato, mushrooms, fried eggs and roasties. For lighter fare, The “Smoked Salmon Potato Cakes” with smoked Irish salmon and the perfect dollop of creme fraiche and caper dill vinaigrette or the “Hipsters Lament” avocado toast will definitely satisfy. Brunch is served Saturday and Sunday from 9 am – 3 pm. Visit www.raglanroad.com or call 407/938-0300. How about a crispy grilled cheese with your Bloody Mary? At RusTeak Restaurant and Wine Bar they do just that! The Bloody Chubby is made with local Winter Park Distillery Genius Vodka, house made “mudd” (their mixer), and cherry tomato confit. The mini grilled cheese gives this grown up drink a whimsical touch of childhood. Maple pepper bacon and fried house pickles are alternative toppings full of flavor. Only available during Saturday brunch from 11AM-2:30PM. Locations in College Park and Ocoee. Visit website for more info and reservations. Southern contemporary neighborhood favorite Soco in Thornton Park serves up a fun brunch on Saturday and Sundays offering Chef Greg Richie's Southern inspired cuisine. To start, don't miss the Soco-Style “Chicken and Dumplings.” Carved Chicken Breast and Lobster Dumplings with Local Mushrooms, Edamame, and Soy Butter are truly delightful. The Summer Peach Stuffed Brioche French Toast with Whiskey Maple Syrup is as decadent as it sounds. The Lobster Benedict is another winner! Of course, you must pair your selection with the house Southern Bloody Mary topped with pickled veggies, available by the glass or pitcher. For an even bigger kick, try the Bloody Caesar topped with OBC Dry Porter and sriracha. For more information, visit their website. 407-849-1800, 629 E Central Blvd, Thornton Park, Downtown Orlando. 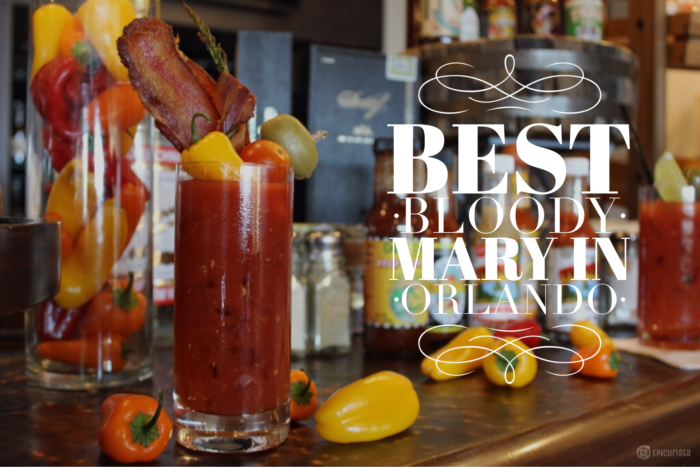 The BYO Bloody Mary Bar with over 75 items at The Hammered Lamb is legendary and considered by many locals as the best Bloody Mary bar in Orlando. 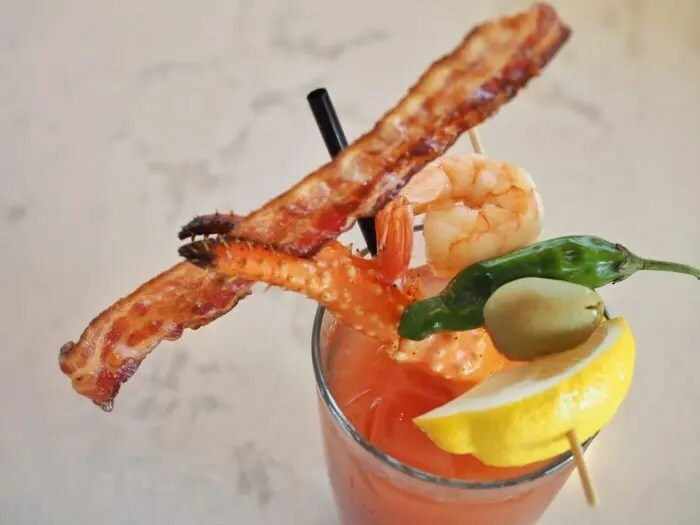 The popular Lake Ivanhoe neighborhood pub serves up shrimp, bacon, cheeses, pickles, local hot sauces and so much more to top your Bloody Mary creation. Herb, pepper, pickle, citrus and bacon Tito’s Vodka infusions provide the needed spirit. You can simply go for the liquid brunch or pair it with one of many plated brunch dishes like Cajun shrimp and grits, the Brekkie burrito, or Breakfast BLT. Served during Saturday and Sunday brunch, 10am – 4pm. Located Across from Lake Ivanhoe, 1235 North Orange Ave, Orlando. For more information, visit their website. Award-winning upscale-casual new American restaurant The Osprey Tavern in Baldwin Park serves up an a la carte brunch menu featuring favorites like the decadent Dutch Baby, Smoked Salmon Benedict, and Scotch Egg Burger. A variety of brunch cocktails are offered but the Tavern Bloody Mary with St. Augustine Vodka is not to be missed. Served Sundays from 10:30am – 2:30pm. Located 4899 New Broad Street, Orlando. 407-960-7700. Visit website for more information. Craft cocktails are just as iconic as the Southern fare dishes at Orlando's award-winning favorite The Ravenous Pig. Sunday Brunches include Tiki cocktails but the Bloody Mary Board for Two is not to be skipped. The mix is made in-house with secret spices that give it a nice twang but not overly spicy. The garnishes included house pickled veggies, coppa ham and cheddar. The watermelon radish garish was a nice touch. Pair it with the B.L.T.E. of housemade lamb bacon, black garlic aioli, with sunny side egg on sourdough and their killer truffle fries, or one of the best Shrimp and Grits in town topped with green tomato chutney and chorizo oil. Don't miss the bakeshop board with housemade pastries. The menu changes regularly but it's always worth the calories. 565 West Fairbanks Ave, Winter Park. For more information visit their website. If you're looking for a posh place to chill on a Sunday, head to Peacock Alley at the Waldorf Astoria Orlando. The resort's beautiful lobby lounge serves a killer Bloody Mary made with celery infused vodka and house-made Bloody Mary mix with a flavorful smoky spice. The garnish is an olive lovers dream - a trio of giant olives stuffed with blue cheese, pickle and spicy pepper. An expansive breakfast buffet complete with made to order omelets, waffles, pancakes, the most sinful nutella stuffed crepes and more is served in Oscar's restaurant. Located in Bonnet Creek, near Walt Disney World. For more information, visit website. Although not your traditional weekend brunch location, if you find yourself in the mood for an epic Bloody Mary while visiting Walt Disney World's Epcot theme park, stop by The Refreshment Port. The Stow Away Bloody Mary is topped with hot crispy chicken nuggets, blue cheese stuffed olives, grape tomato, and a celery stalk. Guaranteed you will be asked "where did you get that?" Head over to the French pavilion for a huge assortment of decadent fresh baked pastries, breads and goodies as you brunch around the world. Now it's your turn to share. What restaurant serves up your favorite Bloody Mary? Let me know because I want to continue exploring, tasting and adding to my list! What’s your favorite garnish? Are you classic celery or crazy toppings? What’s the craziest Bloody Mary ingredient you’ve tasted? Please share in the comments below. I would love to hear from you. Pin this post and check out these great Brunch spots and Bloody Mary cocktails in Orlando. 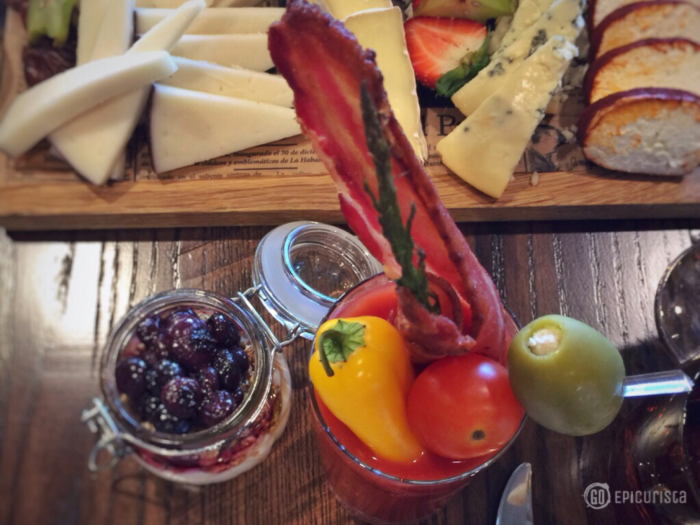 Go #MakeSomedayHappen one delicious Bloody Mary and Weekend Brunch at a time! It’s all about celebrating great food with friends.